Now a New Age Classic, HEAVEN SENT celebrated it's twenty year anniversary in 2003. HEAVEN SENT first played by Tom Schnabel on KCRW's Morning Becomes Eclectic. Played on Music from Hearts of Space and Musical Star Streams. Used in medical operation rooms, workshops, stores, restaraunts, and by yoga teachers throughout the world for it's calming effect. Special thanks to Linda, Lester, Merlin, Drew, my freinds and family for their support. In the mid 1970's I was at a jam session in Machias, Washington (about 45 miles north and a little east of Seattle). When I was leaving the session, I struck up a conversation with a guy I had just met named Buddy. I mentioned to him that my birthday was coming up and maybe we could get together and have a pizza. He asked "when is your birthday? ", I told him the date and he said, "Oh! that's my birthday." Anyway, we were both born the same year, same day, in the same town: Everett, Washington, thus making us astrological twins. Soon there after, we started writing songs together. I had moved to Bellingham, WA to study jazz improvisation at Western Washington University. The university had an alternative branch called Fairhaven. At Fairhaven there was a recording studio. Buddy and I started to record our first album together there called "The Joyous Celebration". One night we had booked the studio and our engineer was unable to make it to the session. I had always wanted to record in a large room with natural reverberation. Buddy and I moved a recording set up and our instruments into a four story cement hallway near the studio and started to record. That evening within a one-hour time period, in a stream of consciousness improvisation, Buddy and I recorded what has become HEAVEN SENT, which received it's name because of the speed in which the music was recorded. Soon after that, I toured the Northwestern States and Canada with a group called Aurora. After a dispute with one of the band members, I quit the band and soon moved to Los Angeles. I kept playing all my recordings for musician friends that I had met in Los Angeles. One day, while sitting with a friend, we came up with the idea of adding environmental sounds to the music tracks. 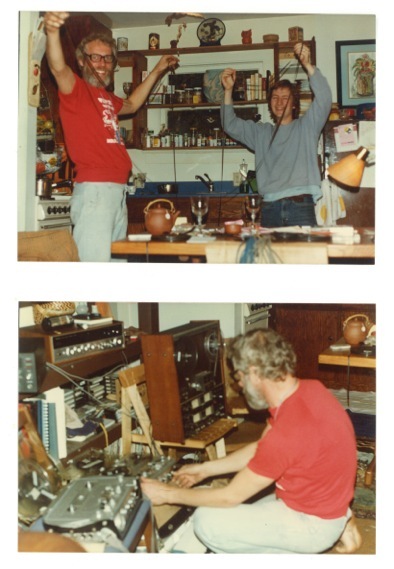 Left: Jan Brodin Right: Jessie Allen Cooper, both holding tape loops. The man wearing the red shirt is the late Jan Brodin. Jan was a movie sound recording engineer. Heaven Sent was recorded before the use of midi and digital sound recording. All of the sounds used for the environmental sound recordings were recorded by Jan on his off time while working on various movies. The ocean and some of the other sounds were recorded Southern California. 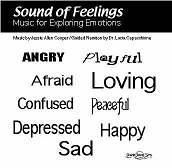 A few of the sounds were purchased from movie sound libraries. My favorite example of Jan's beaming personality is a sound on the track "In The Night." The composition ends with about a minute of night sounds. Jan was from Sweden; I'll never forget his big smile and laugh. About thirty seconds before the end of the piece in several places there is the sound of a big bull frog. We affectionately named him Big Daddy Bull Frog. Big Daddy was recorded in the Florida, Ever Glades on the set of the movie "Take This Job and Shove It." Almost every time Jan would hear Big Daddy voice he would break out in a loud roaring laugh. Before Digital recording was available sound effects were added by using tape loops. In photo there are two of Jan's Nagra Recording machines. These machines were very expensive and used primarily in the TV and Movie industry. The way the sounds were transferred to the master tape on the Recording Heaven Sent, were by using two Nagra machines, creating a tape loop, that would then be transferred to the master tape. original cover The rest is history. HEAVEN SENT was my first album to be released, and was originally available on cassette only. The previous album cover, shown above, connotated a religious experience to some people. That probably hurt sales. However, it was a spiritual event to me. I also really feel so very grateful to have music in my life, and to create and perform music. I also know that music is the highest gist that I could have ever imagined to be part of my life. So in that way, all my music feels to me like it's heaven sent.